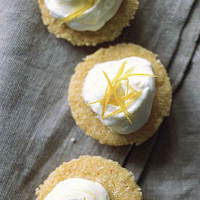 These flourless little cakes have a nutty, shortbread-like base topped with a smooth, lemony cream – take care eating them as they are quite crumbly! Preheat the oven to 170C, gas mark 3. Grease 9 sections of a tartlet tray or line with paper cake cases. Pare strips of rind from the lemon and cut them into fine shreds. Put in a small saucepan with 50ml cold water and the 2 tablespoons sugar and cook gently for 5 minutes until slightly softened. Leave to cool in the syrup. Put the almonds in a food processor and blend until ground. Add the 50g sugar, the polenta and butter and blend until the mixture starts to bind together. Divide among the sections of the tartlet tray or paper cake cases, spreading the mixture level. Bake for 20 minutes until risen and turning golden around the edges. Transfer to a wire rack to cool, then peel away the paper cases, if using. Lightly whip the cream until only just holding its shape. Spoon the lemon curd over the cream and stir together lightly until the cream is streaked with lemon curd. Spoon onto the tarts. Drain the lemon shreds and use to decorate the tarts.